HR Connections: The War for Talent 2.0 - WorldCity, Inc. 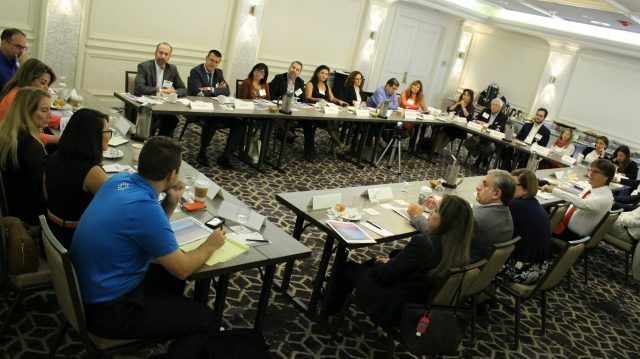 Disruptive talent retention strategies was the topic that sparked spirited discussion and debate at the latest HR Connections session. Ideas and past experiences flew around the table about how to change the way human resources professionals think about keeping their best or most promising employees. “One of the projects I’ve been spearheading the last five months is a talent identification process,” said discussion leader Nathalie Weister, director of human resources for FOX Networks Group, who leads all facets of HR for the U.S.-based Latin America division. Weister said the goal of that project is to identify the top 5 percent of talent in her company, and the reason for this project is the challenge many HR professionals face – retention. Weister noted the ground-breaking McKenzie study in 1997, when discussing the war for talent. The survey highlighted that only 23 percent of 6,000 executives agreed they were attracting the best of the talent pool. Of that 23 percent, they were only retaining 10 percent. Do the math, and only 138 (2.3 percent) of the 6,000 surveyed felt they were both attracting and retaining the best talent. “Fast forward (to today)…and employees aren’t staying at their jobs for 20 years,” said Weister, noting a recent study that showed millennials jump jobs an average of four times in their first 10 years out of college. Weister also cited a recent Gallup poll in which 70 percent of employees are either not engaged or actively disengaged at work, and millennials, which make up one-third of the U.S. workforce, are the least engaged of that group. Here were some of the ideas discussed to combat these statistics and retain your best talent. Weister said if they are giving consumers a variety of different ways to consume FOX content, why not apply the same philosophy to employees. Give employees what they want when they want it. “The mere assessment that they are top talent implies that those are the people who will eventually run your organization,” said Orr Rivero, vice president of human resources for Hilton Worldwide, agreeing with Weister’s project to find the top 5 percent of talent already in the organization. “I like that approach, because at the end of the day, you need to grow those people,” said Rivero. “Ideally, you want to grow them organically. You don’t want to bring them from” an outside source. A full round table of HR professionals enjoyed the latest HR Connections session. Click here for the Facebook Photo Album for the event. What can a company provide to offer employees flexibility, especially for the growing number of young workers who continue to express an interest in travel and/or volunteer work? Magali Jarrin, HR manager for Latin America at Berkley Insurance shared a story of a 25-year-old family member with a PhD in math who left Facebook. He took a one year sabbatical in Thailand, before now working for AirBnB, because he felt he could have a bigger impact there. What if Facebook gave him the freedom of a sabbatical? Adriana Leiro, people director at BUPA Latin America said she had heard about other companies helping pay student loans instead of providing a 401k retirement plan. Many at this HR Connections session noted an employee often leaves the company because of dissatisfaction with their direct supervisor, and in this growing digital age, that often means a newer employee who has more knowledge than the manager.